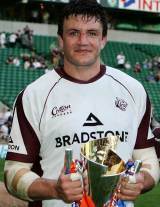 Martin Corry has enjoyed a career at the top of the English game since making his debut for Leicester Tigers in 1997. He made the step up to international rugby later that year, running out for England against Argentina in Buenos Aires. England coach Andy Robinson was replaced by Brian Ashton following the series, and although Corry was reatined in the England squad for the 2007 Six Nations he too was replaced by Phil Vickery as captain. Corry possesses seven Test caps for the British and Irish Lions, touring Australia in 2001 and New Zealand in 2005, also winning a cap in the warm-up Test against Argentina at the Millennium Stadium in 2005.